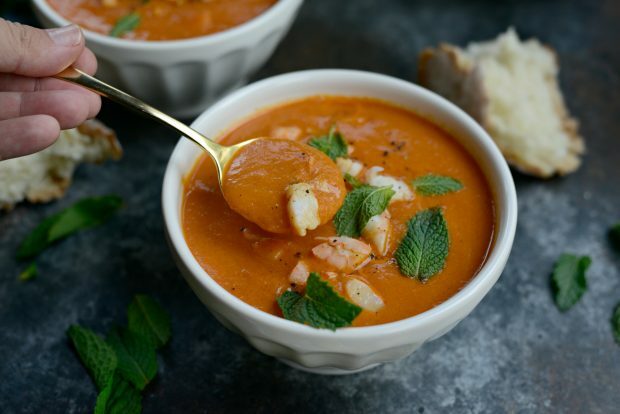 This roasted tomato curry soup is scrumptious! 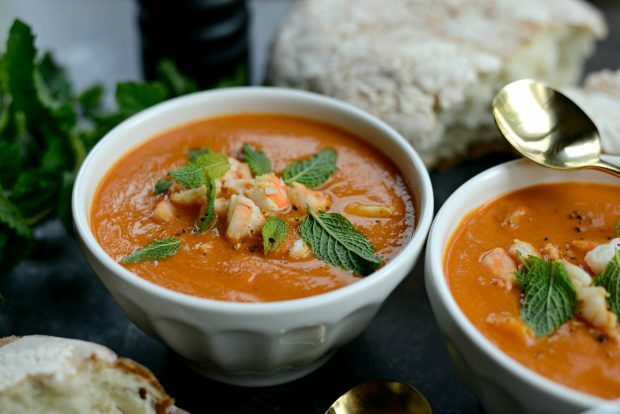 Made with oven roasted tomatoes, homemade shrimp stock and curry powder sends it over the top! Every once in a while I get out of the house and enjoy a nice dinner that I don’t have to prepare. I know, imagine that. One of my most favorite restaurants to escape to dine at is The Root Restaurant & Bar. Ingredients are locally sourced, fresh and fantastic. I’ve never ate anything off their menu that I didn’t absolutely love. From the steak tartar appetizer to the vegetarian pot pie or banana cream pie topped with a toasted house-made marshmallow (!!!). Their menu is always changing with the season and, no lie, everything is positively perfection and worthy of a good bowl or plate-licking. Last week my sister Christine was in town from North Carolina, so a few of us sisters met up for dinner. It was unanimous that my sister Julie and I would let Christine in on the culinary magic that is, The Root. We sipped fantastic wine, had amazing starters and each of us ordered the same entrée salad consisting of field greens, dried cherries, marcona almonds, a light vinaigrette and the softest, most delicious blue cheese I’ve ever tasted. We dined and chatted and ate dessert for close to 3 hours!! My oldest sister Kelly was the only thing missing. Before my entree salad, I had their soup du jour- Curried Tomato Soup. It was creamy, velvety smooth except for the lumps of shrimp. 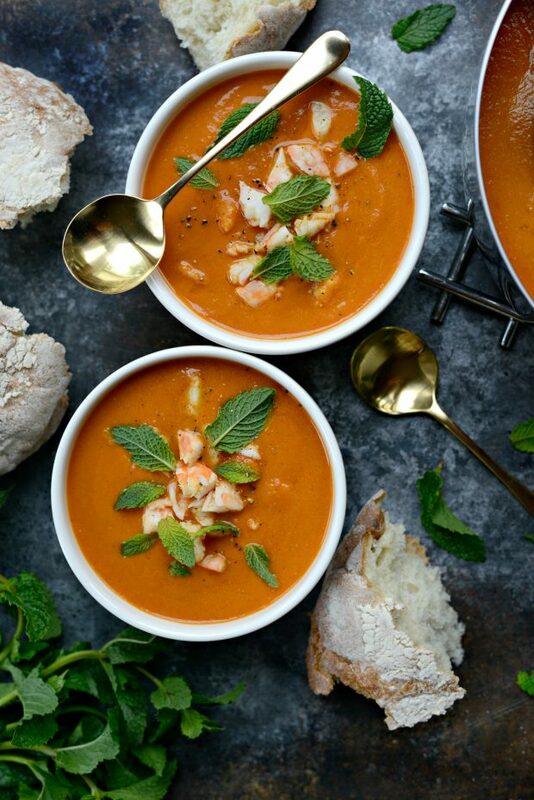 On top, fresh mint leaves were scattered and once swirled into the soup, they were a welcomed fresh pop of flavor. 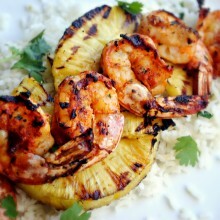 It was a blissful combo of spicy and addicting. This soup was so good, I had to try and recreate it at home. Naturally. 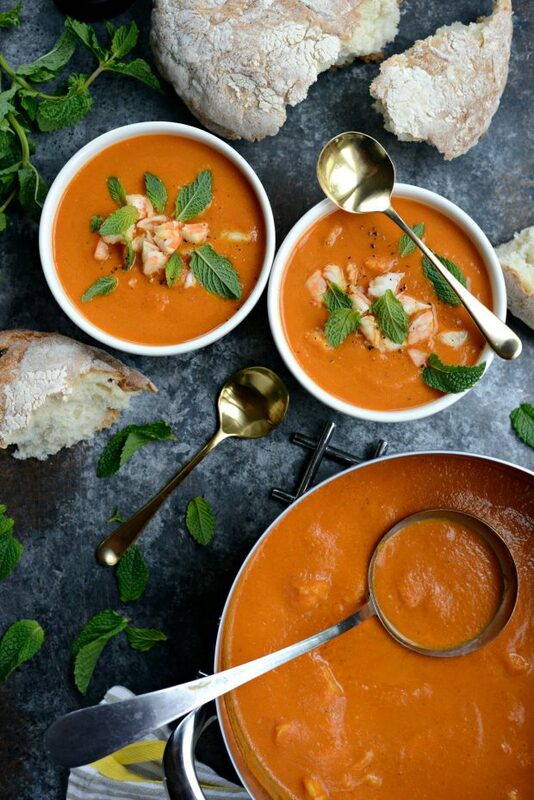 Let’s start making the roasted tomato curry soup, shall we? This time of year I’m always wondering what to make with all my tomatoes. Last year I had an over abundance of cherry tomatoes, so I made this 10-minute pasta sauce. This year it was my Roma’s that took off and I had a ton to use up. So stumbling on this soup at The Root last week sure did come at a perfect time. While my tomatoes were roasting away, I sauteed a cup of finely dice yellow onion, 3/4 cup of both carrots and celery in some butter for about 20-25 minutes or until the carrots were fork tender. Then I added in two cloves of minced garlic, cooked that a minute or so more, then I measured and added in the Madras curry and pulled the pan off of the heat to wait for the tomatoes. Depending on the size of your tomatoes. Roasting the roma halves on a rimmed sheet pan with a little olive oil and s & p at 375° for about 45 to 60 minutes does the trick beautifully. Then I added the shrimp stock that I made the other day, sherry wine, the roasted tomatoes (seeds, skin and all! ), sauteed curried vegetables, and a teaspoon of salt into my Vitamix and pureed until velvety smooth. 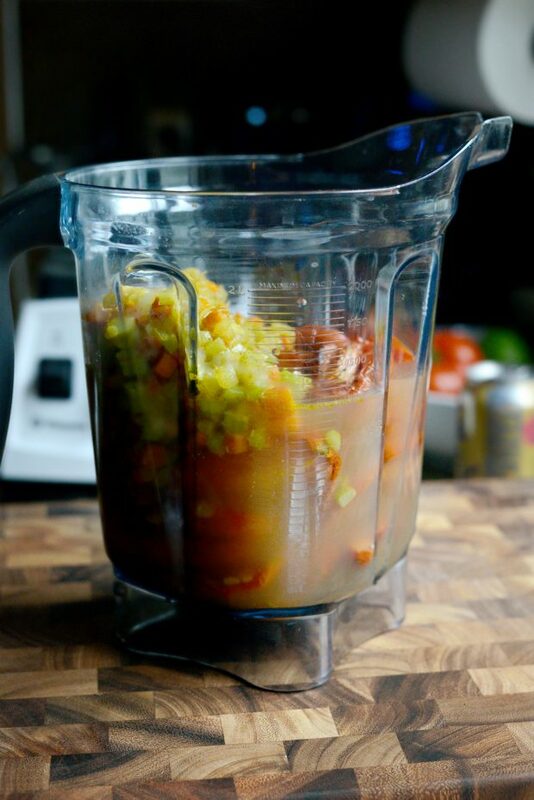 If you don’t have a high-powered blender then you can simply use your food processor. Add the soup back into the pot, taste test and add more kosher salt if desired. I also added a 1/2 teaspoon of cayenne pepper because I love the warm back-of-the-throat heat it adds. 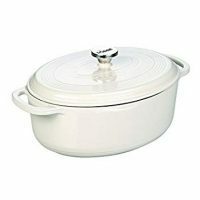 1/4 teaspoon would be perfect for those who don’t want a lot of heat, 1/2 tsp is a smidgen warmer. 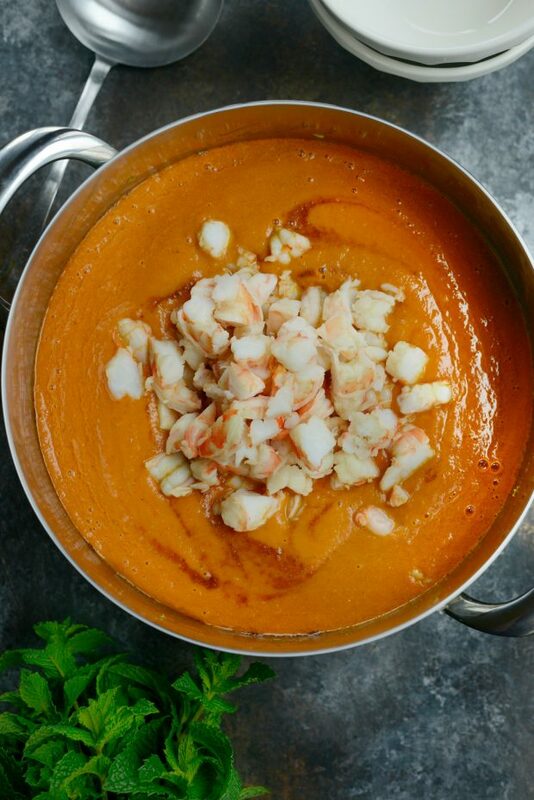 Once I had the flavor of the soup just how I wanted it, I added in chopped shrimp and heated it until warm. 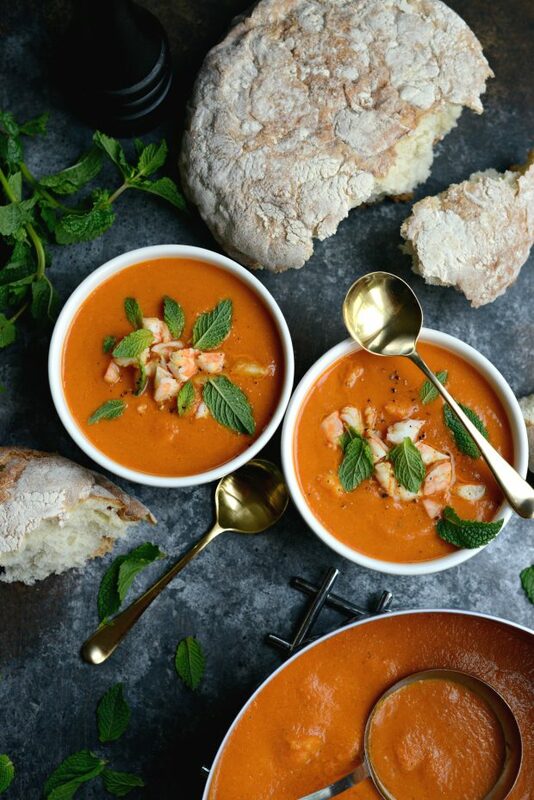 I ladled the roasted tomato curry soup into small bowls and served it topped with fresh mint leaves and with a loaf of crusty bread. I would say this soup is a starter soup or side soup. It’s rich with flavor so, for me, a small bowl is just enough. It’s also creamy, spicy, tomato-y and delicious. 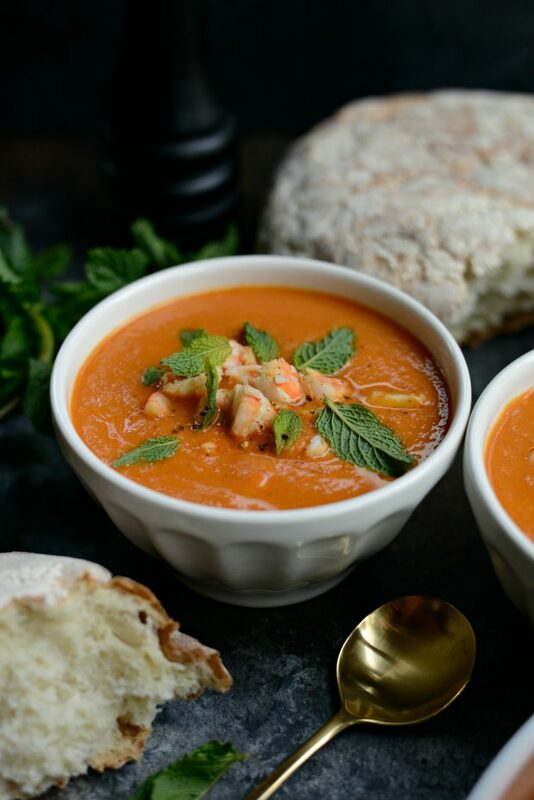 Haileigh, my oldest and fellow shrimp lover, and I loooooooooved this roasted tomato curry soup. We both agree it’s delicious served warm or at room temperature. I believe it would even be good chilled, as a summer soup. No matter how you serve it, it’s a winner. 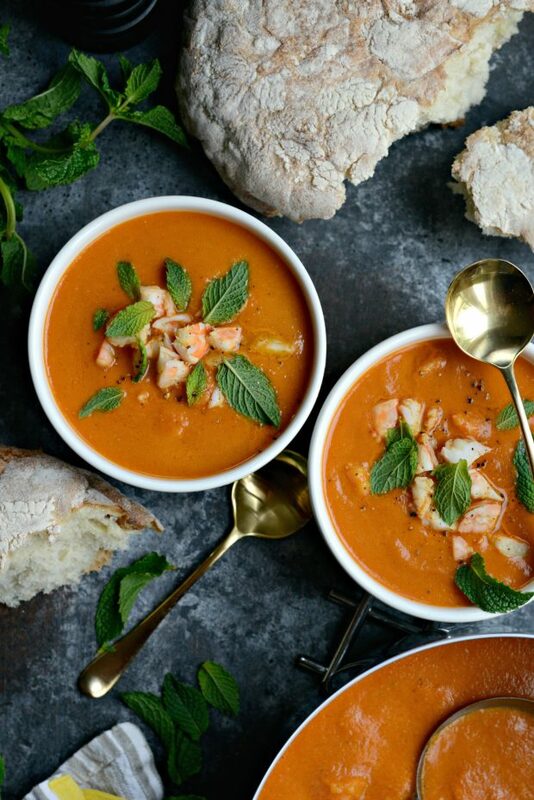 A creamy cream-less tomato soup spiced with curry and cayenne, studded with poached shrimp and topped with fresh mint leaves. 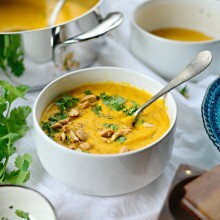 This soup tastes delicious warm or at room temperature. 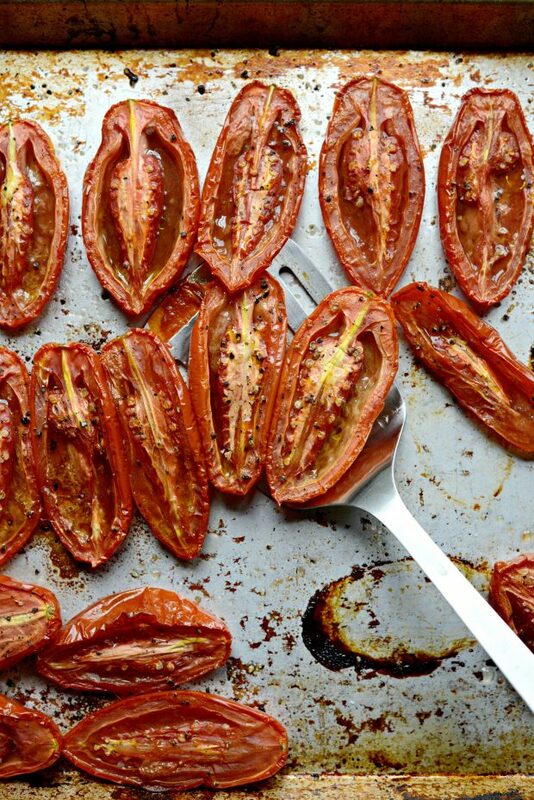 Place the tomato halves on a rimmed metal baking sheet, drizzle with oil and season with a teaspoon of kosher salt and lots of coarse freshly ground black pepper. 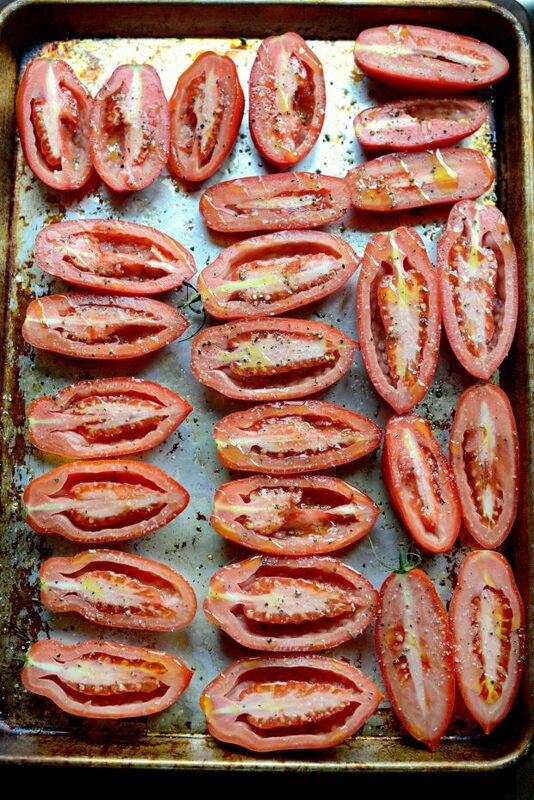 Slide the tomatoes onto the middle rack of your preheated oven and roast for 45 minute to 1 hour. Meanwhile, melt the butter (or add oil) in a deep-sided pan. 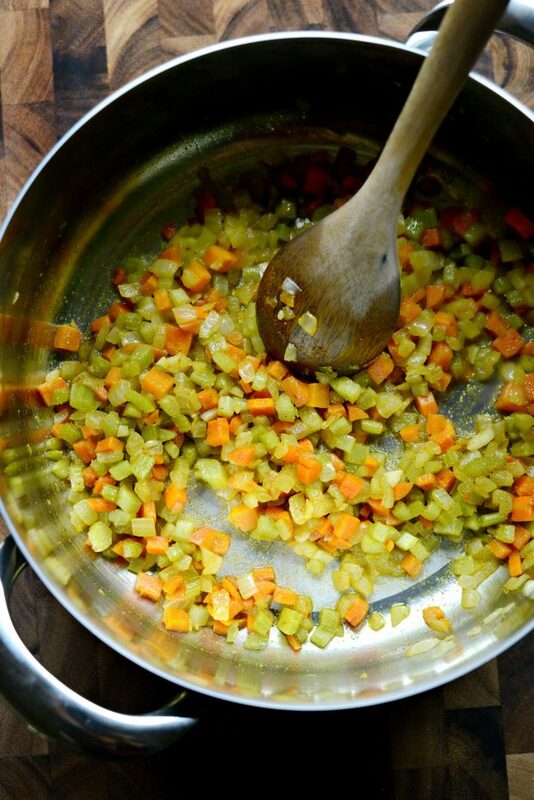 Once melted, add in the chopped vegetables and cook for 20-25 minutes or until the carrots are fork tender. Add in the garlic, cook for a minute longer before adding in the curry. 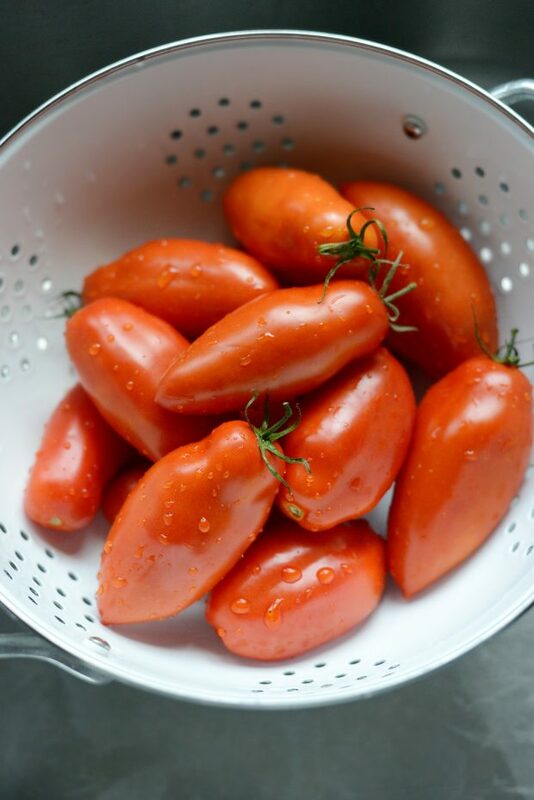 Remove off of the heat until the tomatoes are done. 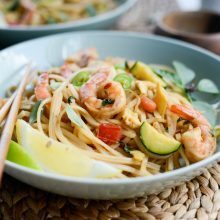 In a high-powered blender or food processor; add the shrimp stock (I start with 2 cups and add more later if necessary, depending on how thin you want it), sherry wine, roasted tomatoes (seeds and all), curried vegetables and a teaspoon of kosher salt. Blend until smooth. Pour the soup back into the pan and season with salt and cayenne pepper to taste. Add in the chopped shrimp and heat until warmed through. 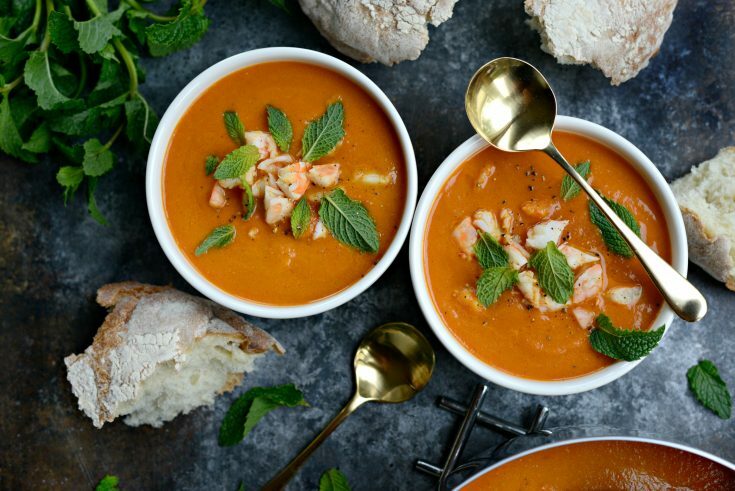 Serve in small soup bowls with fresh mint leaves and more black pepper. How I Cooked My Shrimp: When I made my shrimp stock, after I strained it, I poured it back into the pot and brought it to a boil. Then I added in the raw shrimp, replaced the cover and pulled it off the heat to poach for 10 minutes until fully cooked. Success! Our family of 4 adults, with many conflicting likes, loved this. To be honest I was a bit nervous all the way to serving, but enjoyed it as much as everyone else. Will definitely serve again. Thank you.